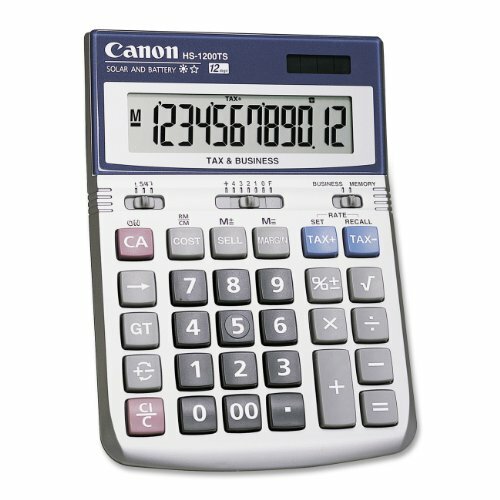 The Canon HS-1200TS may be small in terms of dimensions, but this portable desktop calculator is enhanced with many sophisticated features. The 12-digit, upright angled, liquid crystal display provides large, easy-to-read numbers for maximum viewing comfort. The display indicates the operation symbol (+, -, x, ÷) during a calculation and will also show the equals sign (=) when your result is displayed. The high-quality keys on the HS-1200TS incorporate a "PC-like" keyboard touch to help confirm data entry with every press of a key. This enhanced accuracy will assist you when calculating important business and sales numbers such as the cost, selling price or the desired profit margin of an item.